Many people believe the practice of yoga started as a means to give monks the strength and flexibility (mentally, emotionally and physically) to sit and meditate for long periods of time. In the ancient documents, the Yoga Sutras, compiled over 2000 years ago by the scholar, Patanjali, defines "asana" as "to be seated in a position that is firm, but relaxed." 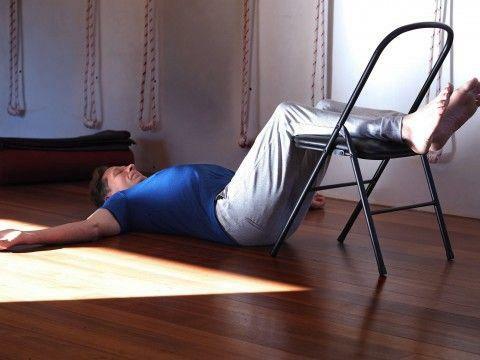 So what does this new research mean for those of us who are committed to the path of Iyengar yoga? What does prolonged sitting – the harmful kind – actually mean? What the researchers found is that some people sit at work for eight or nine hours a day, sit in the car for the commute to and from work and then sit in front of the TV at home. In other words, they sit for as much as 80% of their day. In addition, many of us have very little awareness of how we are sitting in those kinds of situations. We slouch. In our cars, we usually feel stressed about getting where we are going on time. In a vivid infographic, the Washington Post describes some of the impacts on our bodies of slouching in front of our screens. Muscles burn less fat and blood flows more sluggishly during a long sit, allowing fatty acids to more easily clog the heart. The pancreas produces insulin, a hormone that carries glucose to cells for energy. But cells in idle muscles don't respond as readily to insulin, so the pancreas produces more and more, which can lead to diabetes and other diseases. When you stand, move or even sit up straight, abdominal muscles help to keep you upright. But when you slump in a chair, they go unused. Tight back muscles and wimpy abs form a posture-wrecking alliance that can exaggerate the spine's natural arch, a condition called hyperlordosis, or swayback. There’s more – another eight – but we might get too depressed. So, what practical changes can we introduce that address the adverse health impact of sitting? Our yoga practice helps. Practicing yoga changes our posture and our awareness. Asana help us to understand how our body supports itself, and how to work with our bodies to build our strength and flexibility. Sitting on a chair leaves the glutes (our buttock muscles) with nothing to do, and limp glutes weaken our stability. In yoga, every posture, even the sitting ones, involves our glutes. Adho Mukha Svanasana (downward facing dog), Tadasana (mountain) and Utkatasana (chair) strengthen and stretch the glutes. People who sit more are at greater risk for herniated lumbar disks, and lower back pain. Twists, hamstring stretches and Viparita Karani (legs up the wall) greatly relieve and repair the spine, flooding the soft discs between our vertebrae that expand and contract like sponges with fresh the blood and nutrients. When we practice yoga, we create new memories for our muscles, more strength and flexibility, making it easier to bring good posture to our sitting. To be seated is to be supported and held. We can look at asana both as a healthy way of seating our bodies, and as a seat for the mind, for our consciousness and our focus. And if we are not focused in our asana, it is not a seat. The awareness we bring to sitting goes a long way to changing its negative impact. If you think about sitting, you are doing something active -- it is a verb. If you are slouched you are not sitting; there is no consciousness there with sitting. There is a growing interest in the practice of mindfulness – paying attention to our breath and our actions – but this is really just yoga by another name. Mindfulness is about focusing on the present moment; to be present, we have to be mindful of what our body is doing. It’s easy to develop bad habits at our desks. We need our bodies to remember what to do without having to think about it too much. In Tadasana (mountain) for example, we are aware of our feet. Do you ever think about your feet any other time? Our asana reminds our body and we have this memory. 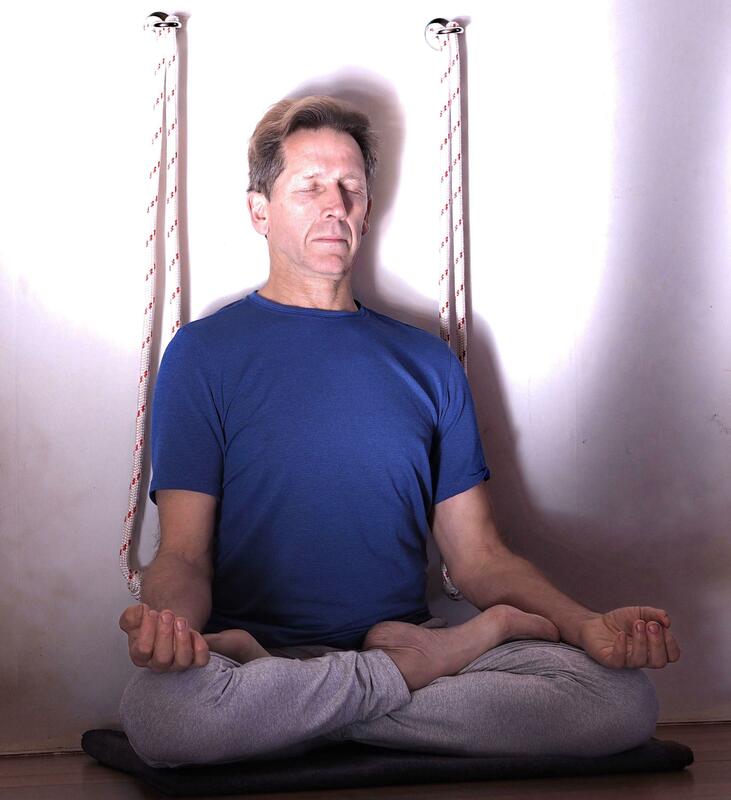 Learning to sit for pranayama or meditation takes effort,concentration and regular practice. But after a while, the mental effort starts to diminish and we can bring more awareness to our breath without loosing our postural alignment. For beginners learning asana is like leaning a new language with new words that have to be learnt before sentences can be understood. Each point or instruction doesn't immediately link with the next to make a coherent sentence. But with practice the instructions, like words in a sentence, link together to build understanding and integration . This is not something we learn once, and then go to the computer and always sit straight. It is a matter of always coming back to the mat and learning how to sit, stand and walk. The way we work in a yoga class, we are watching our body, not thinking but observing. There is the part of you that says ‘I can’t do this or that,’ but to be yogic doesn’t mean to be more flexible. It’s about looking at it differently, simply being aware that we can’t do it, yet, and not making a judgement. All the peripheral stuff of our life -- our work, our worries and our plan – they go when we are doing asana. It is about taking all those outer layers off, and finding who you really are and what you can grow to. Yoga becomes the seat, the support for a new awareness. We cannot always be practicing asana, but our practice will help us to mitigate the impact that prolonged sitting has on our bodies. It will build our muscle memory and improve our awareness. Yoga also changes the way we think about chairs. 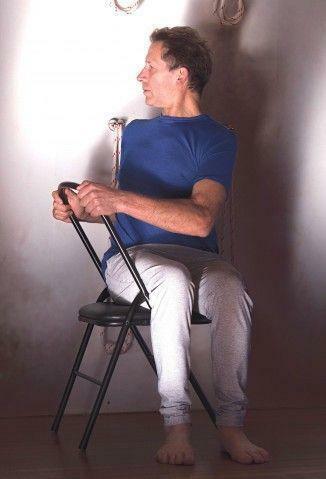 In Iyengar, we use chair to support us in various postures; our office chairs can help us too. We can use our office chair to support a simple twist by gently turning on each side and holding the back of the chair for a moment or two. This floods our spinal disks with fresh blood, and reminds us to sit up straight. Half-Uttanasana, using the back of your chair for support, will stretch the hamstrings and wake up the glutes without putting pressure on your spine. A gentle back bend from the seated position, simply raising the arms above the head, will also help to stretch the abdominal muscles, re-engage or awaken the upper back muscles, relieve the downward pressure on the spine and get blood flowing to the arms and heart. When it comes to our health, it is not sitting that is the problem. It is how we sit, how much awareness we bring to sitting, and how much yoga we do to help our muscles and minds to adopt health-supporting posture. After all Buddhist Monks sit for long periods of time without the associated ill effects of sitting at a computer screen or watching TV in western cultures!